Madeline King is twenty-two, independently wealthy, and living a life of luxury on the Gulf Coast of Alabama. She never planned to fall in love but when a family with twelve children vacations on the beach where she lives, her best laid plans come undone. The eldest--good-natured and dependable Reuben--captures her eye, and before long, her heart. But can Madeline, bipolar and prone to flights of fancy, handle a relationship with someone “normal”? Her best friend, the brooding Nick, questions the wisdom of her getting involved, but are his doubts for Madeline’s good, or does he have his own reasons for keeping her away from Reuben? 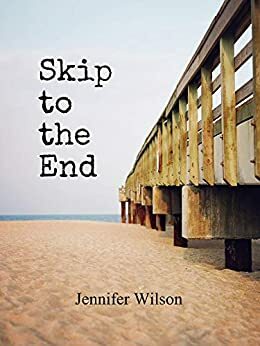 Skip to the End is a gritty, human tale told from the perspective of one for whom each day is a struggle, but who is learning that life is a journey worth living and love is a risk worth taking. Laced with humor and philosophy, Madeline’s story will resonate with readers who enjoy the unpredictable and quirky. Jennifer Wilson lives in Katy, Texas with her husband and eleven of her thirteen children. She likes to write poetry, fiction and memoir in between homeschooling and playing the banjo. Occasionally she hides in the closet with a glass of whiskey and ponders the universe. She blogs at CrazyReal.net. As beachcombers know and first-time ocean visitors soon discover, footprints left in the wet sand at surfside are obscured by the first wave and then erased by the next or the one after that. Would that mental illness be subject to the same natural “order.” For Madelaine, the narrator-protagonist of Jennifer Wilson’s debut novel, mental illness has left an indelible footprint that proves resistant to drugs and therapy. If she can’t be cured, perhaps she can find ways to cope. One of those ways is with relationships. On a visit to the beach she is fascinated by the phalanx of humanity in a single family ensconced in a Gulf Coast rental. The oldest of the 11 children (another baby is gestating) is of particular interest. Madelaine (her all-too-apt nickname is “Mad”) is attracted to the elder son and the whole family. Also appearing on this novel’s stage is Madelaine’s brother and a young man who shared spaced in Mad’s recent stay in a hospital for the mentally ill. She observes that such institutions are often sited near a seacoast. Mayhap the image of healing waters is what appeals; perhaps it helps that the ocean’s vastness should put in perspective the significance of one’s struggle with sanity. Novelists favor the sea as well; it’s a universal device for imparting a sense of danger, of movement, of the ebbing and flowing of the tides of time and temerity. My own first encounter with the ocean took place not far from Madelaine’s seashore manse. On a family vacation with its headwaters in Oklahoma, we finally arrived at a venue I had yearned to visit. On the Mississippi Gulf Coast, my siblings and I saw, felt and tasted the sea. Seemingly, we waded out a half mile and the water was only up to my pre-adolescent knees. Never mind, this was The Ocean! Only later did I realize it was one of the ugliest seascapes in the world. But the white sands of Destin, Florida, were still to come. Sometimes life brings joy even where it shouldn’t exist. Sometimes life gives us beauty that we don’t recognize or we take for granted. For those suffering from mental conditions, the shifting sands of emotion are difficult to use for the building of castles that will last beyond the next high tide. For the “perfectly sane” among us, it’s difficult to sympathize with the sufferers and likely impossible to empathize with them. Which makes “Skip to the End” a kind of textbook for readers seeking insight into a loved one’s battles to leave footprints that make a path toward normalcy – whatever that is – and stability. Don’t view the novel’s title as an invitation to fly over this waterworld of prose. Instead, take the slow boat from start to finish. Rihde the waves with Madelaine on her journey to safer, saner ports of call. This was one I had a hard time putting down. I can so relate to the main character on many levels (though I'm not quite so young) and it comforted me to be able to do that. This is real life stuff, mental illness, family, friends, love, disappointments and triumphs. This played like a movie in my head the whole time I was reading. Wouldn't it be lovely to see on the screen? If you or someone you know or love is afflicted with mental illness this gives a glimpse into their world, their way of thinking, and makes the reader aware that what people see on the outside is not always what's going on inside. Wow, this book made me feel so much. Fascination for the characters. Longing for them to succeed. Compassion for the emotional challenges facing the characters in the book. Deeper insight into the emotional life of someone who is bipolar. And simple delight in a well told story. I loved this book. Enjoyed the story and came to care about the characters. The descriptions made it easy to picture the settings and situations, as well as empathize with the characters, particularly Madeleine. Highly recommend and look forward to Ms. Wilson's next work.